Celebrating summer on the Chicago beach- does it get any better? A lot of sun, volleyball, potluck and grilling. Don't forget the sangria! (For today's sangria, I took my classic red version and made a few tweaks including substituting white wine for the red.) It was the classic summer day that you don't want to end. My contribution to this summer party was dessert. It needed to be somewhat light, but I wanted to utilize the grill as well. 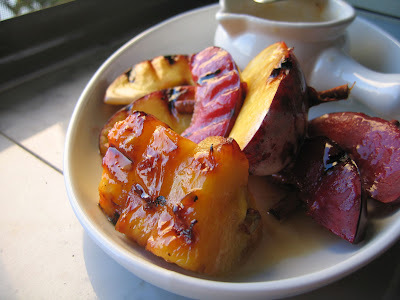 Grilled fruit seemed a given- but also a little plain, a twist was needed. Skewering the fruit onto cinnamon sticks was step one. Slathering the fruit with a caramel rum butter sauce topped it off. This is so good! Clearly you can use whatever fruit you want, I went with pineapples, plum and peaches which paired nicely with the rum. I can see this butter rum sauce will have other applications as well; you'll see it again on this blog. Right now I'm thinking how good it would be to soften a grilled pine nut or pound cake topped off with a scoop of homemade ice cream. Mmmmhhh, I'm drooling at the thought- and that is fat and happy. 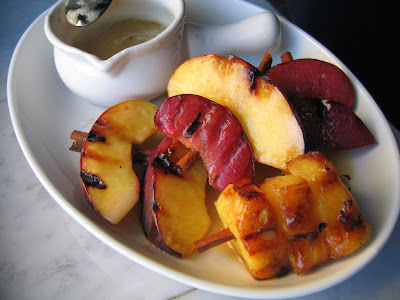 While the butter caramel rum sauce is simmering, clean and skewer fruit onto cinnamon sticks. I used small sticks which only hold about two or three pieces of fruit, but you can get longer ones if you prefer. Use a metal skewer to start the hole in the fruit if you are having a hard time pushing the cinnamon stick through. Simmer the sauce about 10 minutes to meld all the flavors. Brush the fruit with the rum sauce and place on the grill over medium heat for a few minutes per side. 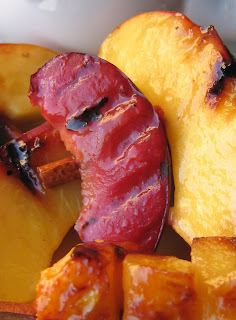 You're goal is to soften the fruit, impart a smoky flavor and get those great grill marks. Brush more rum sauce on as your grilling. Serve remaining rum sauce on the side. **I did list this dessert recipe under the healthy category - if you went easy on the sauce, this is relatively healthy. 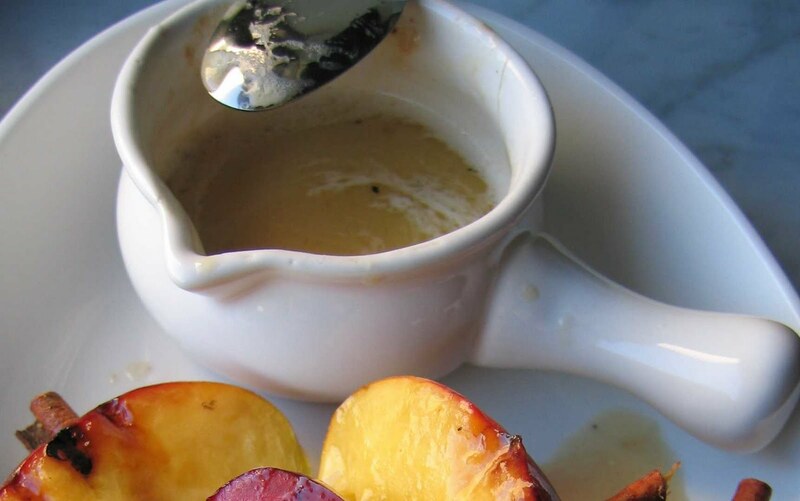 But if you're like me, you'll douse the fruit with the rum caramel sauce because this sauce is so fricken' good!